The following chart displays data regarding location, elevation, slope and the sensors that are currently funded for each of the stations. Some of the stations may have had different configuration of sensors on them in the past, as a result of various projects and funding at the time. Contact Weather INnovations if you are interested in historical station configurations and/or data. The following describes the main equipment that WIN utilizes. 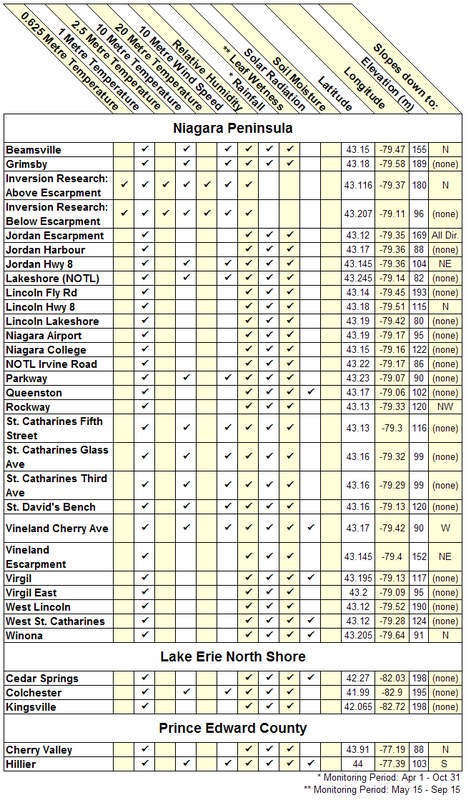 Some devices are not currently funded for the Vine & Tree Fruit INnovations weather stations, but may be used in the future, or in other applications across Niagara, Lake Erie North Shore and Prince Edward County. 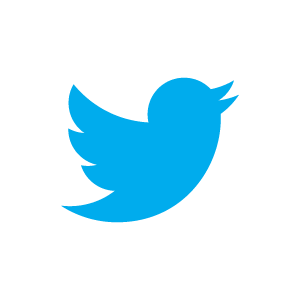 The following measuring and transmission unit is the standard device WIN utilizes. Although configurable, samples are typically taken every 5 minutes and 3 consecutive samples averaged to obtain 15 minute data. The data is then transmitted every 15 minutes to base stations located across Niagara and Chatham. For Prince Edward County, the units are actually cellular-based, featuring a GSM/GPRS modem; but operate in a similar fashion. 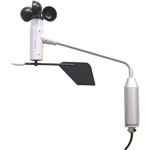 The following anemometer is the standard instrument WIN utilizes. 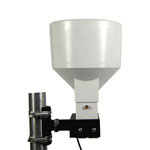 The cup anemometer has a range of 2.5 to 200km/h, with an onset speed of 2.16km/h. The following leaf wetness sensor is the standard instrument WIN utilizes. Manufactured by WIN, it is designed to better replicate the surface area, drying and wetting patterns of a leaf, by means of its cylindrical shape and hydroscopic paint. The sensor produces a voltage when in contact with moisture, which can then be converted to leaf wetness hours or disease severity values. The following pyranometer is the standard solar radiation instrument WIN utilizes. 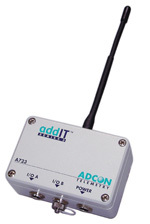 This device has a measuring range of 0 to 1.4 W/m2 and operates in the 400 to 700nm wave length. The following rain gauge is the standard instrument WIN utilizes. Rainfall is funnelled into a tipping cup with a resolution of 0.2mm. The tipper has a capacity of 2.4mm/minute and an accuracy of +/-1%. The following Capacitance Probe (C-probe) is the standard instrument that WIN utilizes. Although configurable, the standard depths WIN monitors are 10cm, 30cm and 50cm. Repeatability of the instrument is +/-1%. C-Probes are a high-end device compared to many other soil moisture sensors. WIN recommends it as the best information piece, with a multi-depth vertical profile. The following temperature sensor is the standard instrument WIN utilizes. It is placed at a height of 1m above ground. The temperature device has a measuring range of -40°C to +60°C and an accuracy of +/-0.3 at 0°C. 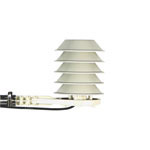 The relative humidity device has a measuring range of 0 to 100% RH and an accuracy of +/-3%.